As in Iraq, so it is in Syria. Sectarian hatreds, tribal affects of distrust and paranoia. Cataclysmic descents into the maelstrom of brutal civil war, whee slaughter is the symbol of righteousness, each side convinced it will prevail because only it has the ear and the eye of god, and thus the right to pursue its sacred duty to expunge the other from the face of the Earth. Suicide bombing, the syndrome of martyrdom at the ready,with the expectation that the name of the martyr will be forever enshrined in the annals of honour, courage, conviction and triumph of Islamist heroism, the impetus. Honour must be sustained. It will all come right in the end, Inshallah. The commentary is expressed as Allahu Akbar! Doing the will of God. To demonstrate just how much determination can prevail, attacks are planned to take place just where the enemy feels it has devised protective devices to make security assured. And then, all is seen to be of little avail when inevitably, the successful infiltrator makes the end sacrifice to finalize his duty to the religion and the god whom all worship as the exemplar of peace. In Islam, however, surrender to the word and the will of god brings peace only when the unbeliever is brought into the fold. An unceasing mission whose finality is never reached. Any mode of persuasion in spreading the inevitability of the word of surrender will suffice; prosetylization by gentle words of promising trust, or the meting out of raging violence through bloody slaughter; each is capable of producing the goal, and each has its place in the armoury of effective conversion. Invitation or coercion. Then there is the issue of the heretics among the faithful. For the Sunni, the Shia sect represents the unforgivable lapse from true Islamic belief. And for the Shia, the presence of the Sunni majority represents the utter failure of Muslims to divine the right path to Allah from the path leading to damnation. Syrian rebels have demonstrated yet again how capable they -- or more to the point, the terror militias that have inveigled themselves among the secular types -- are of entering protected zones. Another high-profile bomb, meant to strike a high-value target. As it happened, the high-value target that was meant to be delivered to the Angel of Death eluded his fate; instead others died. And Prime Minister Wael Halqi lives to see another day. The bomb that hit his convoy as it traveled within Damascus's neighbourhood of embassies, government officials and business elites, killed his guards and wounded eleven other people. Even traitors like Sheik Mohammad Said Ramadan Buti, a Sunni cleric who supported Alawite President al Assad was sent to his untimely death when his mosque was targeted. Top Syrian officials, governmental ministry authorities, wealthy businessmen, they are all prospective fodder for the trademark Islamic radical attackers making their mark among the rebels, themselves ineffective, become reliant on the murderous trade of the jihadists. So, does the West, say for example, NATO, the United States, really want to become involved yet again in a hateful maelstrom of Islamic incivility to each other? Based on the inevitable outcome of previous such engagements, the prospect does not appeal. Quite aside from the vast national treasuries sunk hopelessly into the bid to hasten the fall of one dictator after another only to see the sects fall ravenously on one another -- with another tyrant finally arising from the ashes of a devastated country -- the will is lacking, for the rewards are too meagre. Humane societies look on in utter disbelief and despair at the wanton destruction of heritage sites, of national infrastructure, at the countless homeless refugees desperate to survive the reckless artillery fire, the inexorable bombing, wanting future for their children and mourning the loss of their country. As the numbers of dead civilians increase and nothing intervenes to halt the bloodshed, morale descends, guilt sets in. To act, or not to react? To do either is to do nothing, for nothing detracts the viral hatred from spiralling and ascending and tearing itself inside out. This is the immense power of religious fanaticism and human stupidity. Raed Jaser, who lived for two decades in Canada, simply was incapable of appreciating Canadian values, of finding comfort and a future within the country. He made a deliberate choice of free will instead to illustrate in a shocking manner his disregard for the country, its laws and security, its government and its people, by making common cause with international jihad, in concert with another individual for whom jihad represented honour. His father, although born in what was then Palestine and is now Israel, to Sunni Muslim parents and his mother, a Palestinian born in Saudi Arabia, moved with their son to the Gaza Strip. They moved to the United Arab Emirates on a Jordanian passport, until such time as they no longer felt welcome there. When they moved to Germany they felt unwelcome there, as well. And then they turned to Canada which permitted them entry and haven. The fact that they had found a place in the world that allowed them to live in peace, as equals among others, their rights protected under the laws of the land simply did not stop Raed Jaser from finding violent Islamism a more attractive option than settling down as a Canadian of Arab descent, as countless others had before him, and continue to do. He became fodder for the radical elements who recruit for jihad, instead. And Tunisian-born Chiheb Esseghaier, in Canada on a student visa originally and given post-graduate permanent status in Canada, as a brilliant nanotechnology engineering researcher made his very conscious decision to credentialize himself as a jihadist, and to act accordingly within a degenerate society that had given him the freedom to pursue his academic and professional career. Under surveillance for over a year, the duo plotted to strike a blow for the fascist ideology of fundamentalist political Islam. 1. Chiheb Esseghaier and Raed Jaser, between April 1st, 2012 and September 25th, 2012, in the City of Toronto, in the Province of Ontario, and in the City of Montreal, in the Province of Quebec, and elsewhere, did conspire, the one with the other, to interfere with transportation facilities contrary to section 248 of the Criminal Code of Canada, for the benefit of, at the direction of, or in association with a terrorist group, thereby committing an offence contrary to section 83.2 of the Criminal Code of Canada. 2. Chiheb Esseghaier and Raed Jaser, between April 1st, 2012 and September 25th, 2012, in the City of Toronto, in the Province of Ontario and in the City of Montreal, in the Province of Quebec and elsewhere, did conspire, the one with the other, to murder persons unknown contrary to section 235(1) of the Criminal Code of Canada, for the benefit of, at the direction of, or in association with a terrorist group, thereby committing an offence contrary to section 83.2 of the Criminal Code of Canada. And they join other would-be jihadists in the gathering annals of Canadian security and intelligence, apprehension and the meting out of justice. So why is it that we are so loathe to admit to ourselves that we are treading so lightly on the cusp of our share of what has turned out to be a global threat from 'militant' Islam? We have no wish to cause distress to the countless numbers of Muslims who live in peace with their neighbours, and so we tread lightly, as civilized societies are wont to do. Before she stepped down as secretary of state of the United States of America, Hillary Clinton finally spoke those sentiments that her administration had been carefully avoiding: "We now face a spreading jihadist threat. We have to recognize this is a global movement." Which makes treading that fine line between separating the threat from the belief, and the sensitivities of the masses all that more difficult. It is, however, a problem of immense scope, as a 'global threat', for it surfaces everywhere. Everywhere, that is, that Muslims themselves present themselves. As immigrants and refugees, spread out over the globe. Where first-, second- and even third-generation young men of Muslim descent may find themselves disgruntled and dissatisfied, offended and irate, ready to be persuaded that their alienated destiny is to act as the faithful hand of god, delivering death to the kuffar. The brothers Tsarnaev who enlisted themselves as willing mujahadeen in the jihadist battle against the infidels and whose commitment was finally demonstrated by home-made bombs set off at the Boston Marathon when Tamerlan Tsarnaev and his little brother Dzhokhar casually strolled around among the thousands celebrating a spring day and sunshine, then walked on as people died and were maimed, represented yet another symptom of the Islamist pathology. The threats become far more virally menacing with the reality that a rogue Islamist state with ambitions to rule both the Middle East and by extension the world community, to hasten a global Caliphate as bidden by Islamic scripture, hovers in the background. Iran, and its strident determination to achieve its goal of nuclear weaponry, cannot be discounted as a source of nuclear weapons to be handed to its acolyte terrorist groups. As the world's leading contender for primacy in sponsoring global terrorism, a country that doesn't hesitate to brutalize its own -- so why would it care if countless human sacrifices ensue from that global battle, the better to hasten the appearance of the Hidden Imam and the Apocalypse -- why would it not share weapons of mass destruction with Hezbollah and Hamas and Islamic Jihad and any other irregular militias, including al-Qaeda? Al-Qaeda and its affiliates use modern technology to influence followers, to guide them in the construction and planning of terrorist attacks and the devices that aid their atrocities. From the small, relatively innocuous, albeit shockingly destructive plots that injure mere handfuls, kill slight numbers, to the overall grand plan of a massive turning of the tide in favour of Islamist conquest, the action is set in motion. By dribs and drabs we see events unfold that horrify and forewarn. But hope springs eternal in the normal human mind, not beset by the pathology of religion-inspired moral lunacy, and we simply cannot believe the depths to which human nature can descend in its downward spiral. And, in fact, we scarcely know how we should react, how we must erect defences to stem that dreadful tide prepared to overwhelm and triumph. Haj Amin el-Husseini, better known as the Grand Mufti of Jerusalem, with Nazi SS officers in November 1943. Photo: German Federal Archives. Nazi Germany’s effort to recruit supporters in the Arab world is attracting new attention among scholars. With the 70th anniversary of a Palestinian Arab leader’s sabotage of a plan to rescue Jewish children from Europe coming up next month, Israeli scholar Edy Cohen spoke exclusively to JNS.org about his current research on the role of Nazi and Axis propaganda in the Middle East. Cohen, 41, is on the staff of the Israel State Archives. During the Holocaust years, Haj Amin el-Husseini, better known as the Grand Mufti of Jerusalem, lived in Berlin, where he recorded pro-Nazi radio broadcasts that were beamed to the Arab world and recruited Bosnian Muslims to join an all-Muslim unit of the SS. Seventy years ago, on May 13, 1943, Husseini caught wind of a plan to permit 4,000 Jewish children, accompanied by 500 adults, to travel to Palestine in exchange for the release of 20,000 German prisoners of war. Both the Germans and the British had agreed to the exchange, but the Germans backed down when the Mufti objected. The Mufti was the most prominent Arab figure to support the Nazis, but he was not alone. “My research tracks the effort by the Germans, Italians, and Japanese to spread their propaganda and influence in Palestine and various Arab countries,” said Dr. Cohen, who was born and raised in Beirut and immigrated to Israel in 1995. “They worked hard at it and, to a significant extent, they succeeded.” Cohen has been combing through Arabic-language Nazi and Axis leaflets and radio broadcasts that were collected and analyzed by Haganah intelligence in the 1930s and 1940s. Some of the leaflets found by Cohen feature stark headlines such as “Kill the Jews and the British!” Some were printed on the back of facsimile British pounds or American dollars, so that when they were dropped by German planes over Arab regions of Palestine, they looked like money and immediately attracted attention. Haj Amin el-Husseini, better known as the Grand Mufti of Jerusalem. Photo: American Colony (Jerusalem), Photo Dept., photographer. According to Cohen, some of the Arabic-language Nazi propaganda promised that those who attacked Jews would be rewarded by being given “the most beautiful of the Jewish girls” after Palestine’s Jewish community was vanquished. “That sort of language makes one think of the promise that Muslim terrorist leaders today sometimes offer—that those who die while killing Jews will receive seventy virgins in heaven,” Cohen said. The text of the leaflets and broadcasts were composed by Nazi authors, and then translated into Arabic by members of the Mufti’s entourage in Berlin. Some of the Mufti’s men in Germany were more than writers: several parachuted into Palestine in 1944 with vials of poison that they intended to dump in the Tel Aviv water system. They were intercepted by the British police before they could carry out the attack. Cohen found an internal memo from British police headquarters in Jerusalem in 1939 reporting, “The Arab population in Palestine are listening to the Berlin Broadcasts in Arabic most attentively, particularly in town and village coffee shops where large crowds gather for the purpose.” The report stated that the “uneducated classes are undoubtedly being influenced” by the Nazi propaganda. In 1945, the activists known as the Bergson Group successfully lobbied the government of Yugoslavia to indict the Mufti as a war criminal, because of atrocities committed against Allied soldiers and civilians by members of the Bosnian Muslim SS unit, known as “Handschar,” that he helped create. The Yugoslavs never took steps to extradite him, however. Husseini fled Berlin during the final days of the war but was briefly detained by the French authorities and placed under house arrest in a Paris villa. In response to Arab pressure, the French permitted the Mufti to stage a faux escape, and he found haven in Cairo. Later he moved to Beirut, where he passed away in 1974. Earlier this year, Palestinian Authority chairman Mahmoud Abbas stirred controversy when, in a PA television broadcast, he listed the Mufti’s name among a number of “martyrs and heroes” who have died while fighting Jews or Israelis. Dr. Rafael Medoff is founding director of The David S. Wyman Institute for Holocaust Studies, in Washington, DC. His latest book is “FDR and the Holocaust: A Breach of Faith,” available from Amazon. The El Ghriba synagogue in Tunisia. Photo: Wikimedia Commons. Authorities had reinforced security around the ancient mosque and the Jewish quarter of Djerba for the pilgrimage to prevent any attacks by radical Muslim groups, the AFP reported. Beginning 33 days after the start of the Jewish Passover festival, the Ghriba pilgrimage used to attract thousands of pilgrims and tourists but their number fell dramatically after an April 2002 bombing that killed 21 people. Under the guise of letting go of the Christian holidays, this text provides Muslims with a waiver to add Islamic holidays…. Six Belgian senators introduced a draft resolution in the Belgian Parliament that would make "Islamophobia" a crime punishable by fines and imprisonment. A person would be guilty if he "considers Islam to be violent, threatening or supportive of terrorism…" or "considers Islam to be a political ideology, used for political and military purposes to establish it hegemony." If passed, the law would pose a devastating blow to the exercise of free speech in Belgium. The survey, which was published by the daily newspaper Gazet van Antwerpen on April 19, shows that 60% of Muslim youth believe that they will never be integrated into Belgian society. One in three of those surveyed say that he or she has been discriminated against at school, and one in five say they have been discriminated against at work. More than 50% say they have been victims of racism. Although 93% of those surveyed have Belgian citizenship, 42% of them say they consider themselves to be foreigners. Investigators have found traces of female DNA on a fragment from one of the bombs that exploded at the Boston Marathon earlier this month, U.S. officials said late Monday. While it is still unclear who the DNA matches to, the find indicates a female accomplice may have helped the two brothers suspected in the bombings, Tamerlan and Dzhokhar Tsarnaev, according to officials briefed on the probe speaking to U.S. press. Investigators will now compare the DNA of Katherine Russell, the widow of accused bomber Tamerlan, against the DNA found on the bomb remnant to determine if she ever came in contact with the device, U.S.-based CBS news reported on Tuesday. Russell is not a suspect in the bombings. “FBI agents met with Russell at her parents' Rhode Island home Monday to collect a DNA sample,” the CBS report stated. Tamerlan died after a shootout with police four days after the April 15 bombings. "The FBI is there as part of our ongoing investigation, but we aren't permitted to discuss specific aspects of the case," FBI spokesman Jason Pack was widely quoted as saying by the U.S. press. Russell has remained silent, staying with her three-year-old daughter Zahara at her parents’ house in Rhode Island. Russell's family has issued a statement saying they were shocked by the attack. Still, investigators want to question Russell to find out if she had any knowledge of her husband's plans. In 2009, Tamerlan was arrested for assaulting Russell. Meanwhile, the Tsarnaevs' parents have denied their sons were involved in terrorism. The father of the bombing suspects has accused the FBI of “setting up” his sons. “They just wanted to set up Tamerlan, and Dzhokhar just turned out to be in the wrong place at the wrong time,” Anzor Tsarnaev told the Russian Komsomolskaya Pravda daily last week. A Palestinian man was killed on Tuesday after an Israel air strike on Gaza City, in the first deadly air raid since an Egyptian-brokered truce went into force last November. Gaza’s health ministry said one man was killed and another injured. “A man in his 20s was martyred and another injured in an Israeli air strike... in Shati refugee camp in western Gaza City,” health ministry spokesman Ashraf al-Qudra told AFP news agency. An Israeli government spokesman told Reuters news agency the military had hit a “jihadi who was an expert in manufacturing rockets”. He added that the man had “played a role” in a rocket attack from Egypt’s Sinai peninsula against Israel’s Red Sea resort of Eilat on April 17, which had caused no damage or injuries. Locals in Gaza named the dead man as Haitham al-Meshal, 29,saying he was hit while riding a motorcycle in the north of the enclave. He was believed to be a member of Hamas’s national security force, but relatives said he also belonged to a Jihadist Salafist organization. Both incidents held the potential of wider confrontation along the Gaza frontier. Over the last two months, there has been an uptick in rocket fire on southern Israel after more than three months of complete quiet following a deadly confrontation in November which ended with the Egyptian-brokered truce deal. The latest firing was on Monday when a mortar shell struck an open area in southern Israel, a day after an Israeli air strike on southern Gaza. Neither incident caused any injuries. On Sunday morning, Prime Minister Benjamin Netanyahu warned that Israel would retaliate with great force against any rocket or missile fire on Israeli territory. “I want to make it clear that we will respond in a very offensive way against any rockets or missiles. We will take all necessary measures to ensure the security of Israelis... on all fronts,” his office quoted him as saying. "I was excited to learn the right way to use a weapon. It's important because of the occupation. I feel stronger with the knowledge, which I could use against the occupier." One can just imagine how exciting it must be to a 17-year-old to be given close, authorized exposure to munitions, military hardware, equipment of war that young boys can ordinarily only dream about. And here his dream has become a reality. How extremely fortunate for him. He can anticipate a future -- actually not all that far into the future -- when he can join the forces of the Hamas militias and go to war -- against their neighbour, Israel. Hamas, in its wisdom, and looking itself to the near future, anticipating new recruits coming down the line, reasons that it makes good sense to train them as soon as possible. Why wait until they're of adult age to begin training? Facilitating ease of use with weapons at an early stage in the development of a young boy into an adult makes reasonable sense. Going into conflict it gives them that much more of an edge. So Palestinian schoolboys are now learning how to accurately and confidently fire Kalashnikovs, and how to throw grenades. Initially a two-week program operated by the education ministry under Hamas does the trick. But the boys can always sign up for an extended privilege to continue their exposure to war techniques, and get a taste of their exciting future. The program is called Futuwwa, and it was ushered formally into the state curriculum last September. Boys aged between 15 and 17, an estimated 37,000 Palestinian Gazans, are being introduced to adulthood, initiated into a new generation of Palestinians to struggle against Israel, the occupier. The weekly school classes themselves cover first aid, basic firefighting, and firing a rifle. An initial five thousand boys across Gaza signed up for a two-week camp at a Hamas military base, aside from the exposure they're getting at school. Military-style uniforms of black T-shirts and trousers are supplied. Training is effected by officers from the Hamas National Guard and militants representing Hamas's armed wing, the al-Qassam Brigades. Does life get any better for teen-age boys, fed the pablum of self-defence and proximity to a deadly neighbour from infancy on? Young Mohamed explained that along with martial-arts style street fighting, he and the other conscripts were taught how to throw hand grenades and how to react if one should happen to explode nearby -- "drop flat on the ground next to the grenade, it explodes outward". Isn't that magnificently useful? "We are not conducting military training in our schools, we are providing information", rebuts Mohamed Syam, head of the education ministry in charge of the program. Oddly enough, an article on the Hamas ministry of education website credits the al-Qassam Brigades in a commendation for its contribution to the course. "I don't think you will see a missile coming through here. We have a small military but with the patriots we are playing in the Premier League. It's an improved system that's been tested more than once. I have 100% confidence in our systems." "This represents a big opportunity and a big responsibility. To intercept a high velocity TBM is a great achievement. "Within one metre of launch our response is traveling at half the speed of sound. The newest Patriot -- the PAC-3 -- is like a bullet hitting a bullet. It destroys the target without using any explosives. It obliterates it with kinetic energy." This is the fall-out of the Syrian conflict. A Netherlands military group now stationed inside the border of Turkey with a Dutch Patriot battery, prepared to launch anti-missile strikes such as a Scud missile that might be fired from Syria over the border. Turkey has called in its NATO membership privileges to ensure that it has protection against any Syrian regime strikes meant to offer payback for its censure against the regime's airstrikes against its own people. Adana, 140 kilometres from the Syrian border, is now supplied with a defence. The city is one of over two million population. Struck by a rocket capable of carrying chemical weapons, such a scenario would be utterly devastating. But Syrian President al Assad is increasingly seen as unpredictable, and the potential of striking out in rage against Turkey, once a collegial asset to Syria, now harbouring hundreds of thousands of Syrian refugees, remains a threat. "I do not have eyes on the ground in Syria to report on things but, every time there is a victim, that is bad enough for me. We can see all the TBMs in Syria from their point of origin to their point of impact. When I see a Scud launch and it is a red dot on the scope, I realize that it is going to kill people. It helps us to realize what we are doing by defending the people of Adana. Protecting two million people here is motivation enough for us", explained Col. Buis, Dutch commander of the NATO anti-ballistic mission in Turkey. "We cover all sides of the stories in Iraq, and have done for many years. The fact that so many channels have been hit all at once though suggests this is an indiscriminate decision. "We urge the authorities to uphold freedom for the media to report the important stories taking place in Iraq." Oops, rather to be expected. Iraq's media commission has accused a handful of stations of publishing what they term as misleading and exaggerated reports. A somewhat more serious accusation is their claims that the stations are guilty of airing "clear calls for disorder and for launching retaliatory criminal attacks against security forces." It is all, needless to say, sectarian-oriented. The country which had begun, obligingly enough, under U.S. direction years ago, following the ouster of Saddam Hussein, to rule as a tripartite-representative government sharing ministries and responsibilities among the Shia, Sunni and Kurd authorities has degenerated back into one dominating the others, with a de facto Shia-led government that has alienated its Sunni and Kurdish partners. Al Jazeera was launched by Qatar, an oil-wealthy Sunni-led kingdom and though its reportage-perspective is claimed to be neutral, fully objective in nature, it does veer off, sometimes fully, more occasionally nominally, into subjective territory. Obviously Iraq's media commission, doing the bidding of the government, has decreed that Al Jazeera's operation in the country has been inimical to the cause of unity. A unity that has been obviously strained by the divisive actions of Iraq's Prime Minister Nouri al-Maliki who has very effectively dominated the country's politics, maintained closer ties with Iran, and given short shrift to the Sunni minority, let alone the semi-autonomous Kurdistan. Not surprising that Al Jazeera maintains a Sunni perspective to its reportage. Qatar, its sponsor, is hardly disinterested. A critic along with Saudi Arabia and Turkey of the Syrian regime and by extension Iran, and Iraq, it would hardly commend its news arm for supporting the Shia-led Iraqi government in its opposition to the Sunni population of the country. The commission had charged the stations - another nine satellite TV channels as well as Al Jazeera, with promoting "banned terrorist organizations who committed crimes against Iraqi people." Should the ten stations attempt to continue operating on Iraqi territory they risk 'legal action' from security forces. If forcible shut-down is considered to be 'legal action'. At the present time, there is ongoing violence in Iraq, over and aboard the violent clashes and suicide bombings that erupt at intervals; the violence a result of protests against the Shia government's spurning of shared government. Violence that has resulted only after months of peaceful protests that have accomplished nothing positive in ameliorating the situation of exclusion of the Sunnis. And isn't that, come to think of it, how the situation in Syria that has now claimed up to 100,000 lives, began? From a peaceful campaign of protests, degenerating into clashes and finally the violence of bitter conflict that it has become. Pitting fanatical Shia against extremist Sunnis. The lingua franca of the Middle East. "The changes in the Middle East subsequent to the Arab Spring have not delivered a death blow to al-Qaeda or the larger Islamist Extremist movement. Extremists have gained ground over the last few months in North Africa and the Middle East. Extremists see the Arab Spring countries as legitimate theatres for jihad." Europe and North America have developed internal sieves that trickle through newly recruited operatives anxious and eager to do their part in the global battle launched by fanatical Islamists against the forces of evil represented by the countries that embraced them and their families as immigrants. The flow of citizens from Canada and Europe into Islamic war zones is seen as alarming by national security and intelligence agencies tasked with the protection of their countries and populations. The Netherlands was recently concerned enough to raise its terrorism threat level to "substantial", arising out of fears that among the one hundred Dutch citizens that have trickled through to Syria to fight as mujahadeen there against the Shia-led regime of Alawite-Baath President Bashar al-Assad will be some who plan to return, bringing their newly-acquired fighting skills with them, to acquaint the Netherlands further with what it feels like to be targeted by jihad. The international police organization EUROPOL reported from its perspective this week the appearance of a "distinct rise" in the numbers of EU citizens arming themselves among "groups associated with religiously inspired terrorism". "Syria emerged as the destination of choice for foreign fighters in 2012", states the EUROPOL report. CSIS's assistant director of intelligence, Michael Peirce, informed a Canadian parliamentary immigration committee last month that it remained "extremely difficult" to fully understand what motivates Canadians leaving for Syria. "I should also point out that we see movement at times. An individual may go over and begin activities with the Free Syrian Army and move over and end up fighting for or with the Al Nustra Front, for example. It's very difficult to track", he said. Extremist Islamists, skilled in fighting elsewhere, like Iraq or Algeria, Libya or Mali, and well armed, thanks to the proliferation of weapons that resulted from pillaging the weapons caches left behind by the Libyan military when they were routed by their own opposing militias in Libya, have joined the violent free-for-all now raging in Syria. Many under the guidance of al-Qaeda in Iraq. Where they are determined to take advantage of the Syrian armed opposition, disparate militias, uncoordinated, unskilled, in possession of fewer and less potent weaponry. To, in effect, highjack the revolution to make it over into a true Islamist revolution, one where fundamentalist Islam will take charge of the country under strict Sharia law; yet another country to fall to the Sunni Muslim tide of extremism. "The extent to which the Syrian conflict has mobilized Muslims across the world is significant and may be compared to the conflicts in Iraq in the 2000s, Bosnia in the 1990s and Afghanistan in the 1980s. Based on the sheer scale of recruitment that is currently taking place, European security services are well advised to monitor the situation closely", informs a recent study by the London-based International Centre for the Study of Radicalization. They state that others have also been radicalized; converts to Islam. Reckoning that between 7% to 11% of jihadists, Muslim-born but European-domiciled recruits to jihad have moved into the theatres of conflict in the Middle East. The Netherlands is well represented with up to 107 citizens fighting; France estimated with up to 90, Belgium up to 80, Denmark up to 78 and Germany up to 40 citizens departed to take part in jihad. The Syrian regime itself has not been idle in importing fighters from Iraq, Iran and Lebanon. Sectarian divides aid in impulsive declarations of support from either Sunnis or Shia Muslims to join the battle on one side or the other. Hezbollah is a religious, ideological fit for allying itself with Syria under the auspices of its mentoring state, Iran, whose own al Quds portion of the Revolutionary Guard is heavily involved in fighting for the regime. Hamas, another creature of Iran, proved less compliant through sectarian strains. A Syrian Canadian Council spokesman explains that other than for humanitarian purposes he and his group do not advise anyone to travel to Syria, though he knows personally of two Canadians who have departed to fight, one of whom may be dead. "The whole world is seeing what is happening in Syria and there is this huge sense of desperation. We are being let down, the world is seeing what's happening and they are letting it happen. Red line after red line is being crossed. This is what is drawing people." As for his estimation of how many Canadians were there, fighting in Syria, he responds: "I don't think it would surpass ten with the rebels. On the other side, it's more doubtful but I know for a fact that Hezbollah has a lot of people in Canada. I know this. I live in Montreal and I see them here and they're very well organized." Time to Derail the Saudi "Visa Express"
Preferential, fast-lane treatment for Saudi visa applicants should be considered on a reciprocal basis, with verifiable Saudi progress in stopping funding for Wahhabi-Salafist mosque construction; Salafist and Muslim Brotherhood-affiliated imams; anti-Semitic, anti-Christian and anti-West curriculum materials and jihadi fighters everywhere on Sharia battlefields. One of the more striking—and worrisome—aspects of the April 2013 Boston Marathon terror attack and the cross-border al-Qa'eda/Iran plot to bomb a passenger railway that runs between New York City and Toronto, Canada is the realization that all four suspects so far identified in the two plots had entered legally into the United States and Canada, respectively. Crossing legally into Western countries targeted for terror attacks, entering immigrant and refugee streams without drawing attention from security services, and blending into existing multicultural communities while establishing personas indistinguishable from those of tens of thousands of other new arrivals, appears to be a tried and true modus operandi for Islamic jihadis. It definitely worked for the fifteen of nineteen 9/11 hijackers who were Saudis. Given the reality of that threat, brought home yet again to North America with these two latest plots, now is probably not the best time for the current administration to revive the visa program that allowed the Saudi government to help screen visa applicants for fast-track entry into the U.S. And yet, that is exactly what just happened: an agreement between the U.S. and the Kingdom of Saudi Arabia was reached in January 2013 that would accept Saudi applicants into the Global Entry Trusted Traveler program. Prince Mohammed bin Nayef heads the Saudi Interior Ministry that will screen Saudi applicants when the pilot program begins in 2014. To his credit, bin Nayef has led an internal Saudi crackdown against al-Qa'eda and survived an al-Qa'eda assassination attempt in retaliation. On the other side of the ledger, however, Saudi Arabia is the world's foremost sponsor of both Islamic jihad and Da'wa [Islamic religious outreach], the source of funding and inspiration for promoters of Islamic Sharia law and anti-Western suicide bombers alike across the globe. As revealed in early stages of the recent plot investigations, none of these latest accused terrorists in the Boston Marathon and passenger train plots sneaked into Canada or the U.S. or paid a coyote to get himself past border controls. Rather, all of them (or their families) worked the legal system, then later (even years later) were activated—or recruited and then activated—to carry out an attack mission. According to The Iconoclast, the Tsarnaev brothers had been admitted to the U.S., along with multiple members of their extended family, under the aegis of the Refugee Act of 1980. Tamerlan, the elder brother, arrived in 2006 and was granted Permanent Resident status, while Dzhokhar, who arrived on a tourist visa in 2002, was given asylum status as a Chechen refugee from Dagestan, and eventually achieved U.S. citizenship on 11 September 2012. In the Canada-U.S. railway bombing plot, Tunisian-born Chiheb Esseghaier moved to Canada in 2008 and was "granted permanent residency under Quebec's skilled worker program," according to the Canadian National Post. Accused co-conspirator Raed Jaser, who was born in the United Arab Emirates, arrived in Canada with his parents and two brothers in 1993 on false French passports; although denied a request for asylum based on claims of persecution in Germany, most of the family eventually obtained Canadian citizenship. Jaser might have too, except that he racked up a criminal record while awaiting his final status ruling. However, because Jaser somehow was listed as a "stateless Palestinian" whose father had left the newly-established State of Israel in 1948 (instead of remaining to become an Israeli citizen), there was no place to where Canada could deport him, despite multiple efforts. Every one of the nineteen 9/11 attack hijackers entered the U.S. on a valid passport and visa, too. Janice Kephart served as a former counsel to the U.S. Senate Judiciary Subcommittee on Technology, Terrorism and Government Information; a former immigration counsel to the September 11 Commission; and current National Security Policy Director at the Center for Immigration Studies. She also served as an expert witness in the Havlish case which, in December 2011, resulted in a Federal District Court ruling that Iran was co-responsible with al-Qa'eda for 9/11; and provided testimony for both the 9/11 Commission and the Havlish case. Kephart has emphasized the critical importance of travel documents for terrorists. In the affidavit she wrote for the Havlish case, Kephart discussed how Iranian material support to some of the al-Qa'eda hijackers, in the form of refraining from placing border stamps in their passports, ultimately enabled them to enter the U.S. with "clean passports" that bore no evidence of their having been in Afghanistan, Iran, or other Middle Eastern locations that would have drawn unwanted scrutiny. Although Kephart did not say so specifically, fifteen of those nineteen passports were Saudi passports -- and in at least eight of those cases, Saudi officials at some level would have to have been complicit with the Iranians to arrange a bilateral agreement on the mark in the hijackers' passports that would be seen and recognized by the Iranian border guards. As Steven Emerson at The Investigative Project on Terrorism points out in an important -- and critical -- review of the new Saudi fast-track visa program, the book has never really been closed on Saudi involvement in the 9/11 attacks. Indeed, there is a 28-page classified section of the official 9/11 Commission Report that points to the "plausible involvement of possible Saudi government agents in the September 11th attacks," according to former Nebraska Senator Bob Kerrey, and which former Florida Senator Bob Graham asserts would put our understanding of the Saudi role in those attacks in a different light. Aside from the probable Saudi passport arrangement with Iran, Saudi individuals and entities were key links in the so-called "Golden Chain" of financial benefactors to Usama bin Laden and al-Qa'eda. According to the 9/11 Commission Report, those resources were "put together mainly by financiers in Saudi Arabia and the Persian Gulf states." A key list of al-Qa'eda funders was discovered in a 2002 search of the Bosnian offices of the Benevolence International Foundation, a Saudi-based funding mechanism for al-Qa'eda also designated a terrorist organization by the U.S. Treasury Department. Saudi donors featured prominently on the handwritten list of 20 names. The so-called "SAAR Network," named after Saudi billionaire Sulaiman Abdul Aziz al-Rajhi, was among them; it was raided by the FBI in 2002. The Rabita Trust was also a financial front founded in 1988 by Omar Abdullah Nasseef, who was then Secretary General of the SAAR-linked Muslim World League, and another senior Saudi close to the royal family—as well as to Huma Abedin, Deputy Chief of Staff to Secretary of State Clinton from 2009-2013. Then there is the Saudi student, Abdul Rahman Ali Al-Harbi, who was named "a person of interest" and detained under guard by U.S. federal officials at a hospital after the Boston Marathon attack. Al-Harbi, whose extended family clan includes multiple members identified by the Saudi government as al-Qa'eda terrorists as well as five GITMO detainees, was (or maybe still is) in the U.S. on a student visa to attend college in Ohio -- but was living in the Boston area at the time of the marathon attack. On Tuesday 16 April 2013, the day after the marathon attack, the National Counterterrorism Center (NCTC) created an "event file" on al-Harbi, specifically citing him under a provision (212(a)(3)B) reserved for "proven terrorist activity." In other words, as Diana West reported, al-Harbi was on a no-fly list -- and apparently with good reason. Steve Emerson appeared on the FOX News Hannity show to report that al-Harbi was due to be deported on national security grounds. But then Secretary of State John Kerry met with the Saudi Foreign Minister, Saud al-Faisal; and by Wednesday, 17 April, al-Harbi's event file had been altered and all references to there ever having been a terrorist designation for him had disappeared. Al-Harbi has disappeared, too, at least in terms of coverage by the mainstream media. The U.S. system for background checks (Security Advisory Opinion or SAR) prior to granting visas in cases that raise or ought to raise security flags obviously has some holes in it that do not seem to have been patched since 9/11. Instead, one of the things that has changed, and significantly, is the number of Saudi students studying in this country: as of 2000, before 9/11, there were around 5,500 enrolled. Today, in 2013, according to West, there are about 35,000, thanks to a "reckless agreement" between President George W. Bush and the Saudi government in April 2005. Before the U.S. completely turns over security of the chicken coop to the fox, we need to get a solid grip on how many other Saudi students besides al-Harbi may have slipped through the SAAR system. Congressional leaders, who have asked DHS Secretary Janet Napolitano for a briefing on the al-Harbi case, have been stonewalled. The Saudi relationship with al-Qa'eda as well as Iran -- whether past, present, or ever -- needs both clarification and immediate termination. Preferential fast-lane treatment for Saudi visa applicants should be considered on a reciprocal basis, with verifiable Saudi progress in stopping funding for Wahhabi-Salafist mosque construction; Muslim Brotherhood-affiliated imams; antisemitic, anti-Christian, and anti-West curriculum materials; and jihadi fighters everywhere on Shariah battlefields. AP Photo/David GuttenfelderA North Korean soldier hurries along a sidewalk covered in fallen cherry blossoms in Pyongyang on Friday, April 26, 2013. PYONGYANG, North Korea — The heart of this city, once famous for its Dickensian darkness, now pulsates with neon. But since 2010, as part of the campaign to build a new city for their new leader, Pyongyang has been under construction. Scaffolding covers the fronts of scores of buildings across the city. Red banners painted with slogan “At a breath” – implying breakneck work at a breathless pace – flutter from the skeletons of skyscrapers built by soldiers. Today, the street would not look out of place in Seoul or Shanghai. Indeed, many of the goods – Hershey’s Kisses, Coca-Cola and Doritos – on sale at the new supermarket were imported from China and Singapore. AP Photo/Kyodo News)North Korean women in traditional dresses gather to offer flowers to statues of their late leaders, Kim Il Sung and Kim Jong Il, at Mansu Hill in Pyongyang,Thursday, April 25, 2013, marking the 81st anniversary of the founding of North Korean army. AP Photo/Alexander F. YuanSoldiers stand on a train transporting military supplies in Pyongyang, North Korea, Thursday, April 18, 2013. For years, foreign goods and customs were regarded with practiced suspicion, even as they were secretly coveted. Kim Jong Un has addressed that curiosity by encouraging trade and by quoting his father in saying North Korea is “looking out onto the world” – a country that must become familiar with international customs even if it continues to prefer its own. Syrian Prime Minister Wael al-Halqi escaped an assassination bid on Monday, surviving a blast that targeted his convoy in Damascus, Syrian state television reported. In comments released by the state news agency SANA but not shown on television, Halqi was quoted as condemning the attack as a sign of “bankruptcy and failure of the terrorist groups,” a reference to the rebels battling to overthrow Assad. The blast shook the Mazzeh district soon after 9 a.m. (0600GMT) and sent thick black smoke into the sky. The Britain-based Syrian Observatory for Human Rights said one man accompanying Halqi was killed as well as five passers-by. “The terrorist explosion in Mazzeh was an attempt to target the prime minister’s convoy and Dr. Wael al-Halqi was unharmed,” state television reported. It later broadcast footage of Halqi, who appeared composed and unruffled, chairing what it said was an economic committee. The Observatory reported that a car bomb targeted Halqi’s convoy as it passed through the Mazzeh district of Damascus. Director Rami Abdel Rahman told AFP that the bomb appeared to have been detonated from a distance. State television said the explosion happened near a public garden and a school in the neighborhood, a well-secured district that is home to embassies, government buildings, intelligence facilities and several political figures. “Children cried and immediately hid under their desks as I rushed to lock the classroom door,” Bassel Laham, a teacher at a school near where the bomb went off, told Al Arabiya. An AFP photographer at the scene said several vehicles were destroyed in the blast, including a bus burned out by the explosion. The windshields of other cars nearby were also blown out. State television al-Ikhbariya broadcast footage of Halqi attending a government meeting, but without indicating whether the images were from after the attack or not. Mazzeh is an upscale neighborhood in western Damascus, home to a number of senior regime figures. Halqi was appointed prime minister in August 2012 after his predecessor Riad Hijab defected to the opposition. The last major attack in Damascus was on April 9, when a massive blast killed at least 15 people in the center of the capital. Some of the groups fighting with the opposition to President Bashar al-Assad’s regime have resorted increasingly to the use of car and suicide bombs to target senior government figures. In July 2012, a suicide bomb attack killed Syria’s defense minister and deputy defense minister and left the country’s interior minister seriously wounded. As part of that counter-offensive, Assad’s forces probably used chemical weapons, the United States said last week. U.N. Secretary-General Ban Ki-moon said Monday that a team to investigate the use of chemical weapons in Syria was currently in Cyprus awaiting Damascus’ permission to enter, Al Arabiya correspondent reported. The United Nations said in February that around 70,000people had been killed in Syria’s conflict. Since then activists have reported daily death tolls of between 100 and 200. Five million people have fled their homes, including 1.4million refugees in nearby countries, and war losses are estimated at many tens of billions of dollars. For a complete guide to top Syrian figures from Assad's power circle, visit Al Arabiya's Lion's Den. The BBC's Anbarasan Ethirajan in Dhaka: "Rescue teams went inside last night and there was a fire... they had to pull out and they could not save a young woman"
Rescue work on a collapsed building in Bangladesh has entered a sixth day, but officials say they no longer expect to find any survivors. Heavy lifting gear is now being used to raise slabs of concrete at the Rana Plaza garment factory, where at least 380 died after Wednesday's collapse. PM Sheikh Hasina visited the site and some of the victims on Monday. The owner of the building appeared in court on Monday and was remanded in police custody for 15 days. Mohammed Sohel Rana - who is one of eight people, including his father, arrested in connection with the disaster - entered court wearing a bullet-proof vest and helmet, and faced angry crowds chanting "hang him, hang him". An editorial in the Daily Star says Bangladeshi garment manufacturers "have convoluted the idea of 'competitive' and 'cheap'," and workers are "bearing the brunt of this". Also in the Daily Star, Hameeda Hossain writes: "Even as we mourn the dead... it is time to question why the state has repeatedly ignored violation of laws, why regulatory mechanisms fail to monitor systemic failures, why political patronage confers impunity for corporate crimes." Muhammad Q Islam writes for bdnews24: "We still have a 47 million strong army of very poor people who will be willing to take all the risks that culminate in injury and death... Our economic policies explicitly rely on continued availability of this work force to fuel our economic growth." Fariha Sarawat says in the Dhaka Tribune that while buyers should take some moral responsibility for such disasters "the state aids and abates this hostile environment by repeatedly siding with the interests of the manufacturers, instead of the workers." He is due to be questioned over allegations of negligence, illegal construction and persuading workers to enter a dangerous building. At least 3,000 are estimated to have been in the Rana Plaza building when it collapsed. About 2,430 are now known to have survived but hundreds are dead or missing. Some relatives of those missing complained that the prime minister had not spoken to them during her visit to the site. "We could have talked to her, and she also could have listened to us," said Monowara Begum, the mother of one missing worker. Sheikh Hasina also visited some of the survivors in hospital. Bangladesh news site BDNews24 said she had assured them they would receive help from the government. Bangladesh, it has emerged, refused international help with the disaster. 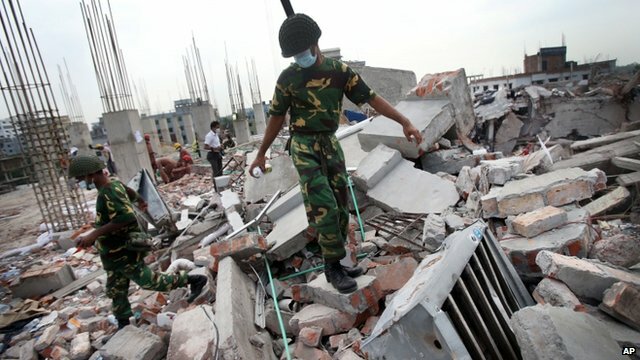 The UN's search and rescue unit, INSARAG, offered its help soon after the building collapsed but was told Bangladesh would manage the situation with its own well-equipped emergency services, reports the BBC's Mark Doyle. It's unusual for countries to decline help when disaster strikes - whether they are rich or poor. Hundreds of rescuers converged on Haiti after the 2010 earthquake, for example. They performed similar work to that needed in Bangladesh. Japan, a far richer country, also accepted lots of help following its earthquake and tsunami in 2011. Bangladesh's Home Minister Mohiuddin Khan Alamgir said no help was needed because the local emergency services were well equipped. This would appear to have been contradicted by the sometimes poorly-equipped volunteers scrabbling through the rubble and the apparent starting of a fire by people trying to cut their way through the building. A senior diplomat with the United Nations' International Search and Rescue Advisory Group said an offer of help was made to Bangladesh very early on "because the lifesaving window of opportunity is in the first few days". But, according to the diplomat, the Bangladesh government said it would manage the situation through domestic means. On Sunday night, rescuers working deep inside the rubble were told to leave, as cranes were brought in to begin lifting the heavy blocks of fallen concrete. "We are proceeding cautiously. If there is still a soul alive, we will try to rescue that person,'' army spokesman Shahinul Islam told reporters. "We are giving the highest priority to saving people, but there is little hope of finding anyone alive." Fire brigade chief Brig Gen Ali Ahmed Khan said crews had seen bodies lying on the ground inside, but that "no-one was seen alive". Rescue co-ordinators said that work with heavy-lifting gear would be done carefully to avoid further collapses and to protect bodies trapped under the debris as much as possible. On Sunday afternoon, the operation was halted when a fire broke out as sparks from a metal-cutter ignited scraps of fabric in the rubble. Four firefighters were taken to hospital. The BBC's Anbarasan Ethirajan says rescuers had been trying to free a trapped woman for a number of hours when the fire began, but they later reported she had not survived the fire. Mohammed Sohel Rana went on the run following the collapse of his eight-storey building, but was arrested on Sunday close to the Indian border. Bangladeshi TV later showed Mr Rana - a local leader of the youth wing of the prime minister's Awami League party - in handcuffs after being flown back to Dhaka by helicopter. A total population of some 150.4m, 88% under the age of 55. GDP in 2012 was around $110bn - the ready-made garment (RMG) industry makes up 80% of all exports, totalling more than $15bn in 2012-13 financial year. About four million people are directly employed in the RMG industry, most of them women, earning an average monthly salary of roughly $40. Anger at the building's collapse has triggered days of violent protests in Dhaka demanding those responsible be punished and for an improvement in factory conditions. Garment industry workers across the country were given the weekend off, in the hope that the anger would fade. But on Monday, thousands of workers walked out of factories in the Ashulia and Gazipur industrial districts shortly after they opened, and staged a protest march, reportedly setting fire to an ambulance.